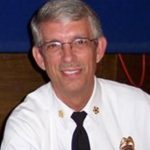 Chief Gary Morris retired from the Phoenix Fire Department as an assistant chief after 30 years, where he was also a long-time safety chief working for Chief Brunacini, to be the chief for the Seattle Fire Department. He presently is the chief of the Pine Strawberry Fire District in Arizona. Chief Morris was a member of the IAFC’s original Safety Committee and was Chairmen of the Committee immediately prior to it evolving into the Safety, Health and Survival Section. He was a charter member of the IAFC’s “Crew Resource Management” project and an original member of the firefighter “Near Miss Reporting” project. He was the IAFC representative on the project team that reviewed the UL’s live burn research on lightweight truss construction and published one of the first articles on the early collapse hazards. Further, he tasked by the Section to be the lead advocate to adopt the term “May-Day” as a national standard which has since become a national standard. Chief Morris is passionate about firefighter safety and survival as demonstrate by his performance and seeks your vote.